Damian Peach video of Mars rotating. The Red Planet, from June 2016. I’ve been an astronomer all my life, and I love taking my ‘scope out to observe the sky. I have a 20 cm Celestron C8 S-GT, which is small enough to use easily but big enough to catch nice views of planets and deep-sky objects. Damian Peach has a ‘scope just a little bit bigger, a 35.6 cm Celestron C14. Still, while I dabble with holding my camera up to the eyepiece and taking snapshots, when he takes astrophotographs, what he creates are masterpieces. That is Mars, imaged by Peach between June 14th and 18th, when it was at its closest to Earth for the year. Earth is closer to the Sun than Mars, and orbits more rapidly. We lap the Red Planet every two years or so, and when we do the two planets are closer together than usual; in late May 2016 they were about 75 million km apart. 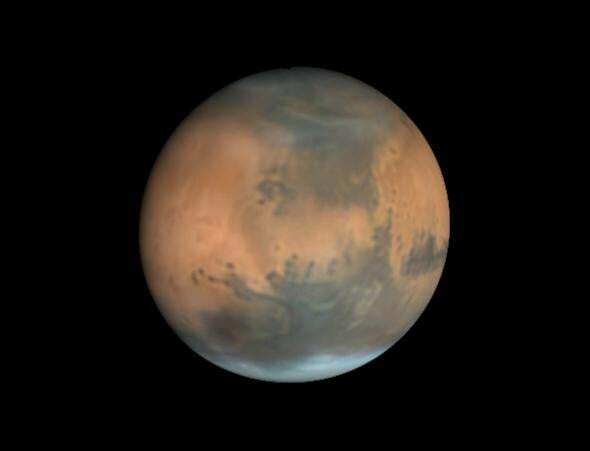 Mars appears bigger around that time, so more details are apparent. Mars takes about 24.5 hours to spin once, and Peach mixed and matched different images of Mars over the few days he shot it to create that stunning animation of the planet rotating. You can see broad dark patches, including Syrtis Major on the right at the start of the video. That’s a very flat shield volcano, and the dark color is due to basaltic rock, common from ancient eruptions on Mars. You can also see the polar ice caps, the southern more prominently. When these images were taken it was just before autumnal equinox on Mars, moving from northern hemisphere summer to winter. The southern pole had been in winter for a half a year or so (seasons last twice as long on Mars due to its longer orbital period), so the ice is more obvious there. The video ends with the mammoth Olympus Mons volcano hoving into view. It’s the largest known volcano in the entire solar system, roughly 600 km across. If it were centered on Colorado, the entire state would be covered by the base, and it would extend well into the surrounding states as well. Peach is amazing at solar system photography. Obviously! But you should go to his website and poke around. Beauty there abounds, as it does in the solar system itself.